Over on her blog Esse Diem, my friend Elizabeth Gaucher has a fun meme where you take a picture of yourself with a favorite book. (Thank goodness the directions were “a” favorite book, or I would have been paralyzed with indecision.) 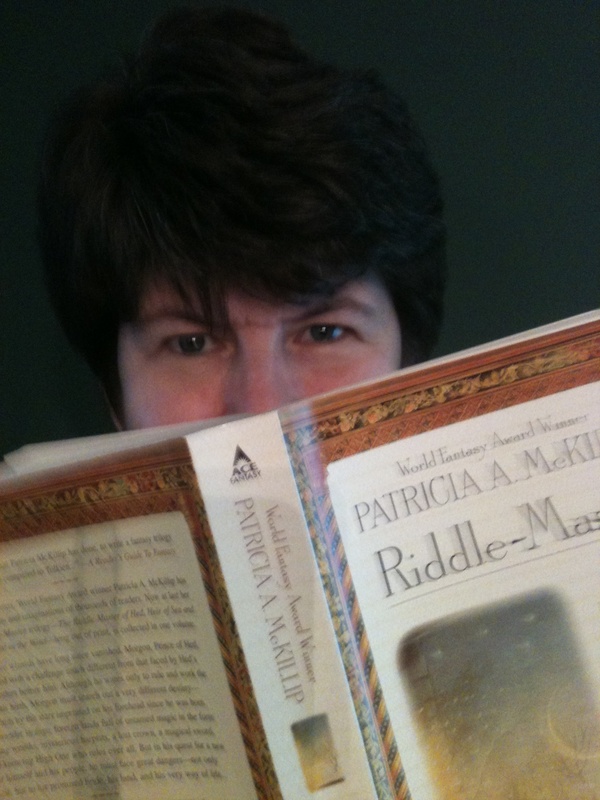 I chose Riddle-Master: the Complete Trilogy by Patricia McKillip. I really didn’t need the copy of the book you see in my picture. I already had the trilogy in three separate, much-loved, 1970s cover paperbacks. But the two page “new introduction by the author” was worth the price. In it McKillip waxes nostalgic about the impact Tolkien had on her young life (Hey, mine, too!) and on this trilogy in particular. She is kind in remembering her younger writerly self and says, “She taught me magic, and the love of storytelling, which are two things that do not die unless you let them.” That is what Patricia McKillip, and particularly The Riddle-Master Trilogy, taught me, too. This entry was posted in Uncategorized and tagged books, Esse Diem, Patricia McKillip by kaherndon. Bookmark the permalink. Hey, I have that book too! 😉 Altho’ it’s still in my ‘to be read’ stacks. 😦 From the books I have read of hers – per your rec. of course, she does have great descriptive writing. And not the type that you want to skip over. So important! I’m rereading the trilogy yet again. It’s always fascinating to see what has lodged in my mind and what has escaped and to wonder why that is.